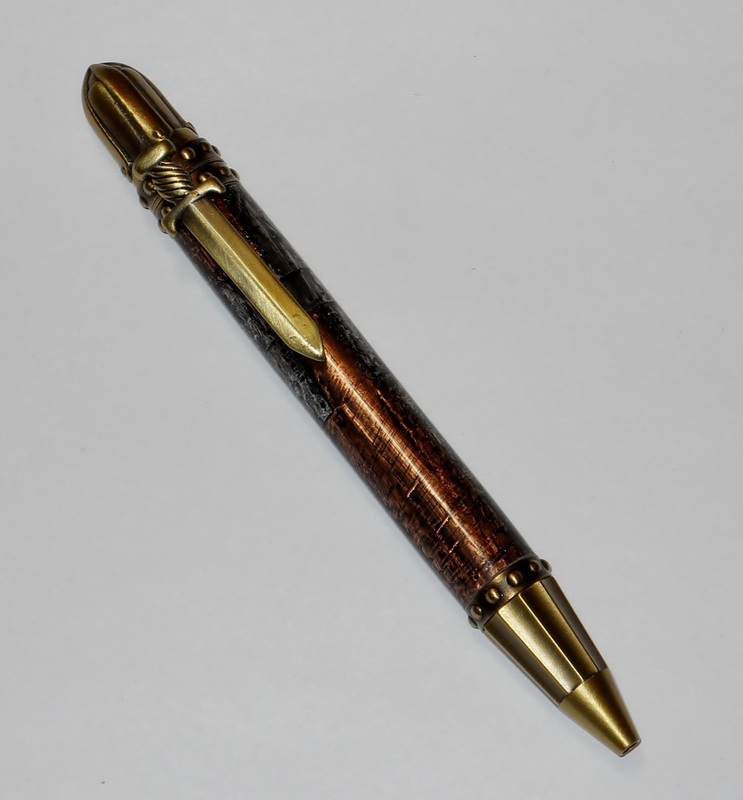 Steampunk Clockwork Bronze - A watchface and bronze gears cast in resin and hand turned on the lathe comprise the body of this Sierra Vista pen. Steampunk! 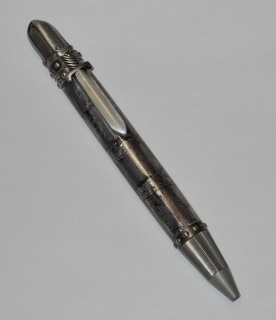 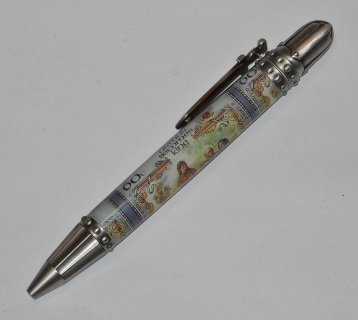 Knights Armor Antique Pewter Pen. Steampunk! Knights Armor Twist Pen in Antique Pewter and steampunk blank. 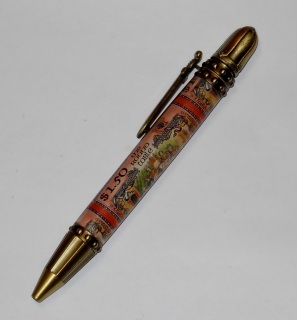 Steampunk! 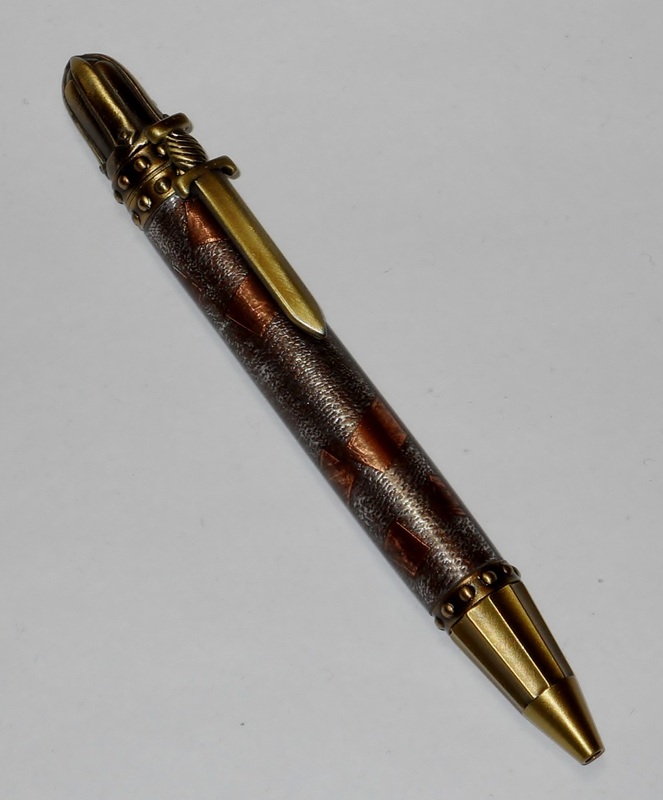 Knights Armor Twist Pen in Antique Brass and steampunk blank. Distressed and tarnished metal including copper cast in resin, on a brass knights Armor pen. Victorian pen in antique brass trim. The body is double dyed - black and gold - black ash burl. 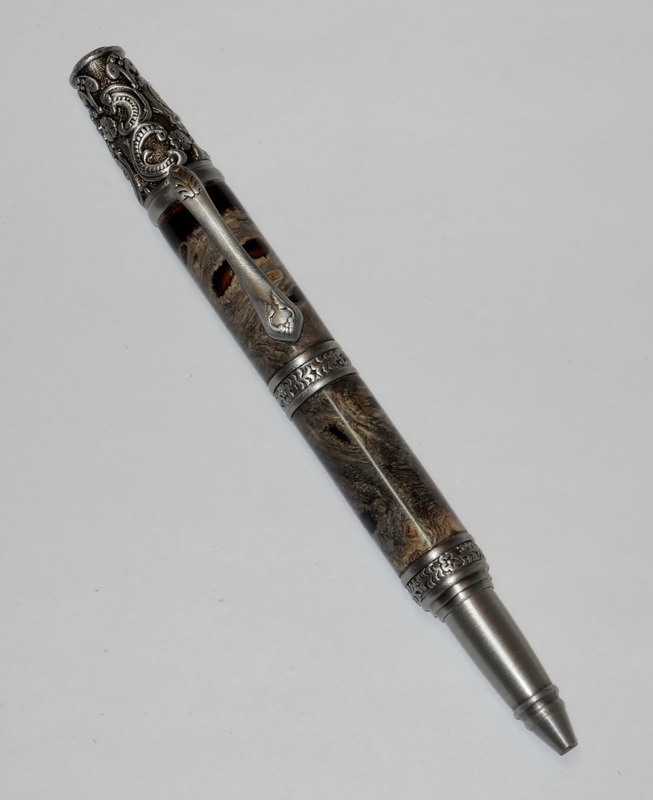 Victorian pen in pewter trim. The body is purple resin filled buckeye burl. 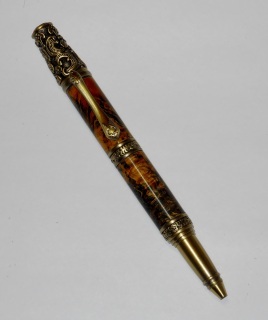 Victorian pen in gold trim. 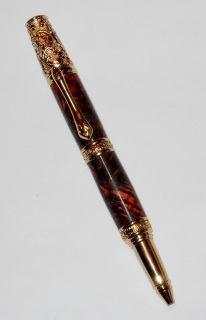 The body is double dyed - red and black - black ash burl. Victorian pen in gunmetal trim. 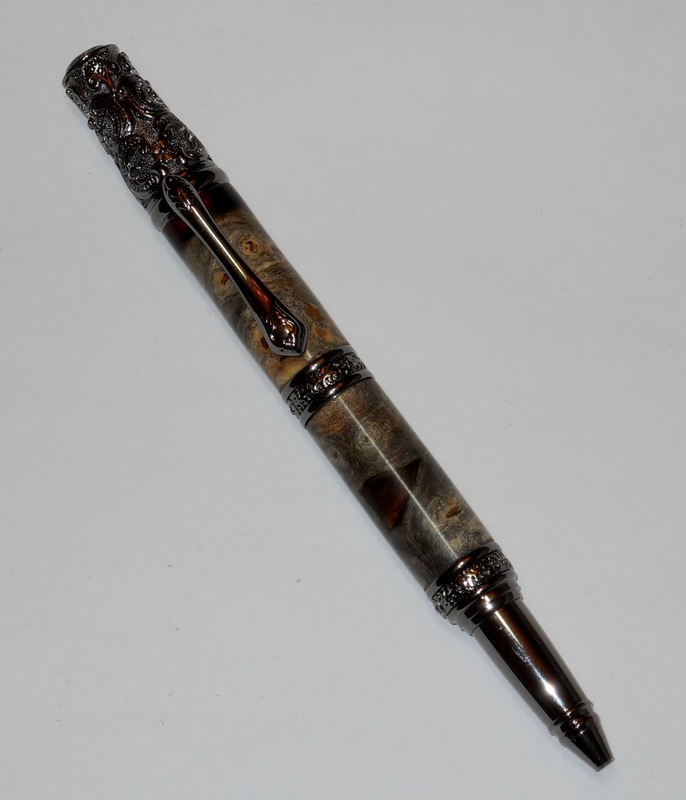 The body is blue and red resin filled buckeye burl. 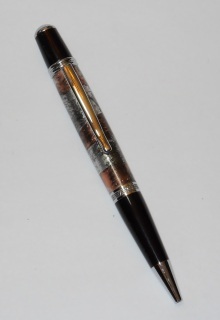 Copper and aluminum foil with patina added, on a chrome sierra. King Arthur postage stamps cast in polyester resin for on a pewter Knights Armor pen, the first of a series of 8 planned in a Camelot series. Round Table postage stamps cast in polyester resin on a brass Knights Armor pen, the second of a series of 8 planned in a Camelot series. Arthur Becomes King by pulling Excalibur from the stone postage stamps cast in polyester resin for on a pewter Knights Armor pen, the third of a series of 8 in a planned Camelot series.